More than 10 years of service to the Wanganui community has earned Dot McKinnon an impressive award. 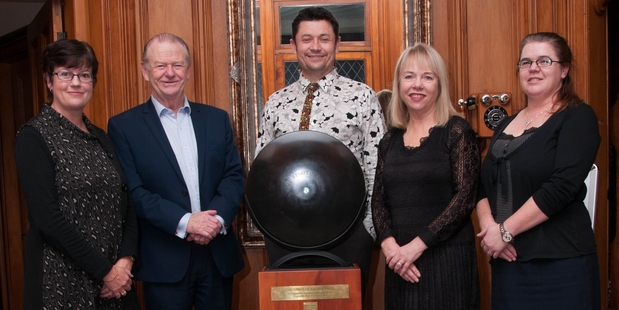 The Spirit of Aegis award - chest-high and comprising a sturdy base with mounted shield - is given annually by Law Alliance NZ, and Ms McKinnon is the first Wanganui recipient. Aegis comes from Greek mythology and means shield or cloak, and the award recognises those in the legal profession who shield or protect people in need. The presentation was made by Allan Gallagher, of Law Alliance NZ, to Ms McKinnon at her offices at Moore Law on Somme Parade on Thursday, with clients, friends and colleagues attending. The shield will stay there for a year before moving on to its next recipient, while Ms McKinnon gets to keep a smaller replica. As well as the award, the prize included $4000 to be given to charities of her choice, and she is donating $2000 to the mayoral flood relief fund and $2000 to Prisoners Aid and Rehabilitation. "My husband, Richard, has worked with Prisoners Aid and it is a charity that has always struggled for money, so it was a good one to choose," Ms McKinnon said. Currently chairwoman of the Whanganui District Health Board and a former deputy mayor of Wanganui, her substantial community involvement includes setting up the Castlecliff Community Charitable Trust, a performing arts trust, being on the PowerCo trust, a Sarjeant Gallery trustee, chairwoman of the New Zealand Masters Games, a trustee of Collegiate School, working on a major regional initiative with a number of councils and iwi and on various other economic development bodies, and numerous activities with Rotary.